The two-day Library Carpentry workshop was led by Chris Erdmann, Laura Wrubel, and Megan Potterbusch. 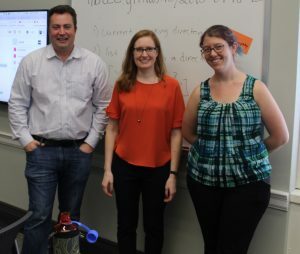 In September, the Library hosted a Library Carpentry workshop to help library staff develop advanced digital skills and explore tools useful for managing digital collections and metadata. 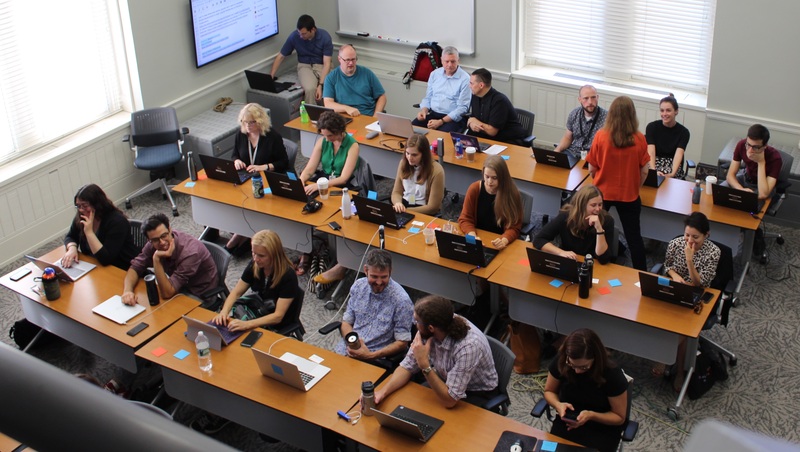 Building on the Library’s previous Software Carpentry workshop, the 2018 workshop presented an opportunity for us to explore the growing “Library Carpentry” curriculum. This effort, which adopts the same instructional approach and hands-on learning styles as the Data and Software Carpentry initiatives, has developed workshop modules specifically for people working in library and information roles, especially stewards of digital collections and data. Library of Congress staff from various units attended the workshop, including the Integrated Library System (ILS) Program Office and the Digital Collections Management and Services Division, as well as librarians from Johns Hopkins, Georgetown, and the University of Baltimore. The Library chose to host a Library Carpentry workshop for its cutting-edge curriculum and its innovative approach to skills-building. The Library Carpentry initiative aims to “help library professionals work more efficiently, and potentially teach the skills they have learned to colleagues, students, and researchers.” We were pleased to welcome Chris Erdmann, the Library Carpentry Community and Development Director from the California Digital Library, who coordinates Library Carpentry workshops across the nation. As Chris put it, Library Carpentry offers “people working across a spectrum of library- and information-related roles [the chance to] get an initial understanding of the approaches and tools that we use and teach in our community. For libraries to become more data savvy, we really need everyone on board as data-related work exists across a spectrum of roles and we need to work as a team. Library Carpentry provides an onboarding opportunity for everyone in the community to join the team.” Chris began the first morning of the workshop with a jargon-busting discussion aimed at surfacing technology terms that participants had questions about and sharing collective knowledge to get everyone more comfortable with digital tools and terminology. 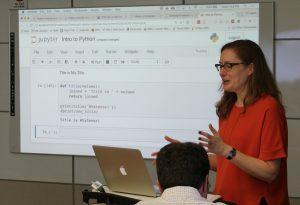 Laura Wrubel led the Python scripting module on Day 2. Although we were not able to record the lessons since the workshop focused on specific examples and situations, the curriculum from the workshop is openly available at the Library Carpentry website. There you can view and go through the lessons on data and regular expressions, OpenRefine, and Python. Additional lessons are available, which cover the use of shell scripting, Git, Web data gathering and management, and databases. In addition, the schedule and information about the September workshop is available here. Library of Congress staff from various units attended the workshop, including the Integrated Library System (ILS) Program Office and the Digital Collections Management and Services Division, as well as librarians from Johns Hopkins, Georgetown, and the University of Baltimore. The growth of the Library Carpentry initiative since our 2017 Software Carpentry workshop has been a welcome development. In line with the Library’s Digital Strategy goal to cultivate an innovation culture, such training opportunities empower staff with improved digital tools and allow us to respond to the changing information landscape and increasingly digital nature of library collections. Abbey Potter, Senior Innovation Specialist in LC Labs, observes, “Digital collections and digital research are always evolving. Library Carpentry teaches skills that are critical to build up and strengthen for staff working with digital content. We need to connect the expertise of our curators and the practice of digital content management so that we can provide meaningful access and preservation services. I look forward to even more of our staff participating in Library Carpentry workshops.” The Digital Content Management section aims to expand work with other units across the Library to build staff capacity for managing the Library’s extensive digital collections, as well as for onsite researchers who are interested in building up digital research and analysis skills. This is a syndicated post. Read the original at The Signal 2018-11-09.